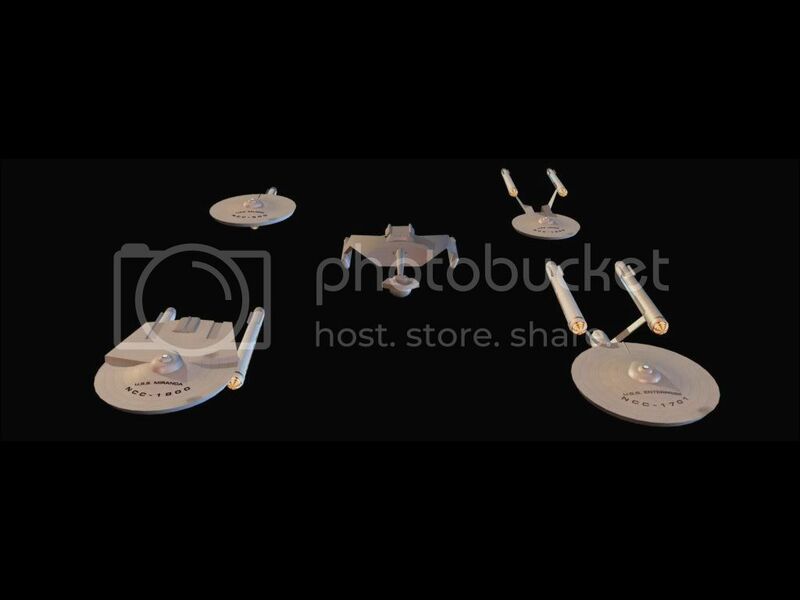 This was originally just going to be a low-poly version of the Enterprise I was going to throw into my NCC-1701 thread, but it's turned into a full-blown project for me. I think I am going to attempt to mod a game with these. These all go about 2,000 polys or less. These ships, aside from the Enterprise and the Klingon D-7 are not strictly "canon", in other words, they've never been officially recognized by Paramount as Star Trek ships. They've all appeared in various games, however. 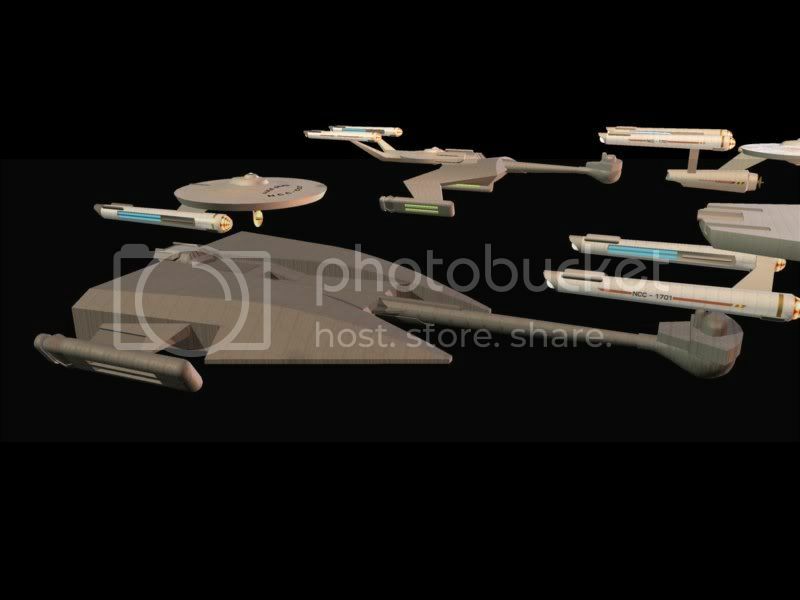 Clockwise from top left are the "Saladin" class, the "Loknar" class, the "Constitution" class (Enterprise), a pre-refit version of the "Miranda" (Reliant), and at center, a Klingon D-7. Those are really good! I like them loads. 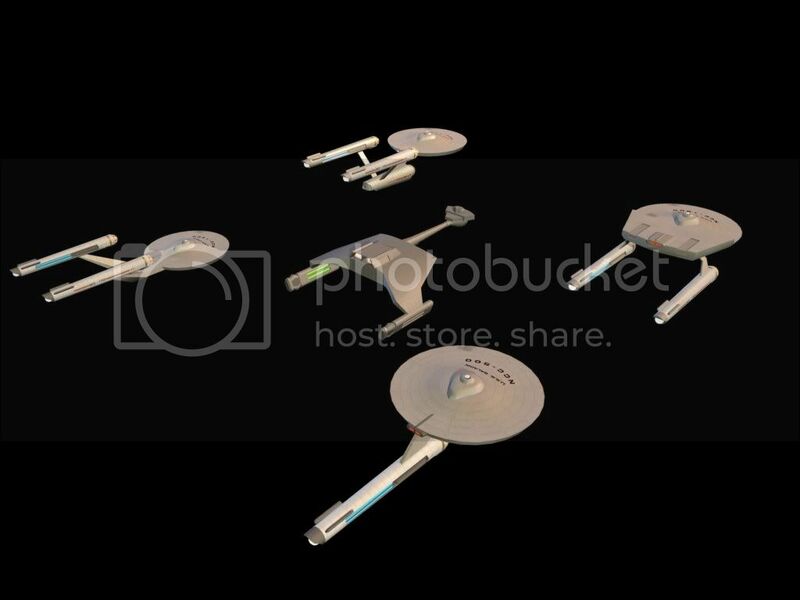 I am a star trek fan, they look exactly like the ships off Star Trek. how long did it take to make these? 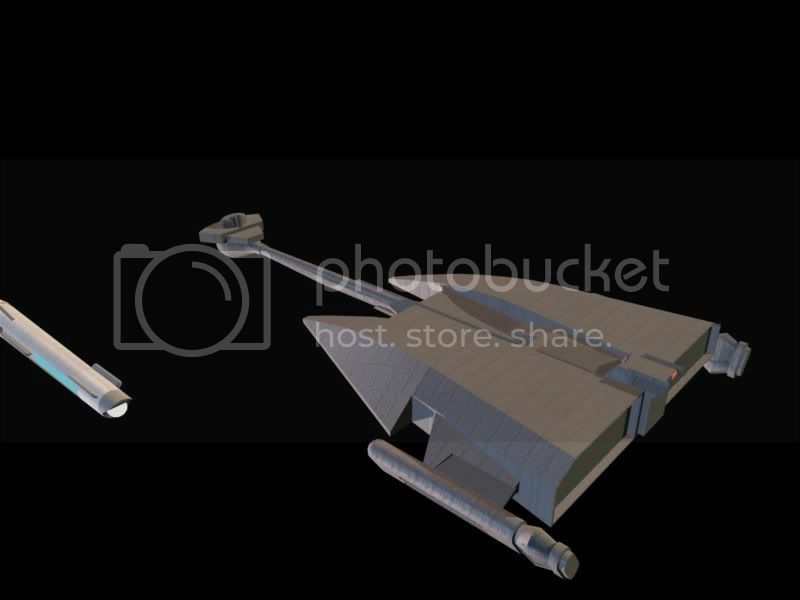 The low-poly version of the Enterprise proably took me about two hours. That I could use the same textures from my high-poly version certainly saved tons of time on that. Because the Federation vessels share a lot of common parts, the rest took anywhere from about 10 minutes to an hour or so. The Klingon D-7 probably took me two hours, and of course needs some better texture work. 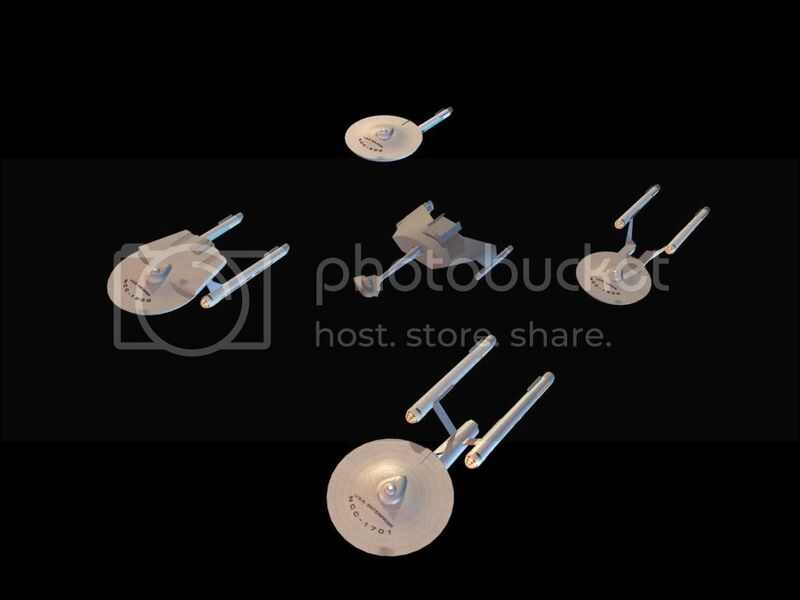 The Federation vessels need some more work on the textures as well, if you look close the saucer sections on all of those have the proper number and name, but the warp nacelles all still say NCC-1701. This, like the Loknar, was a FASA design for its "Starship Combat Simulator" about a million years ago..
EcoTyler: Thanks. As to selling them to a game company, I think there would be problems there. 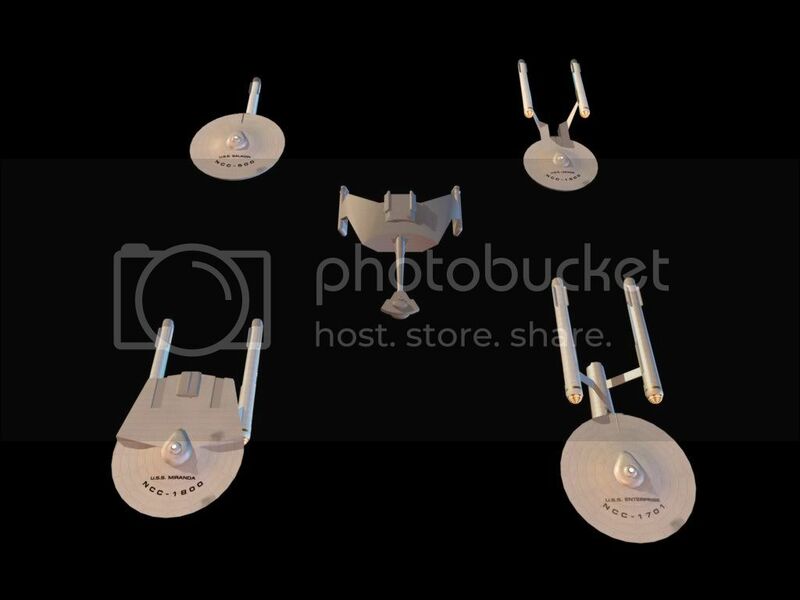 Since Star Trek is a IP owned by Paramount or whoever it is these days, I doubt they'd appreciate me selling them their own stuff. Not to mention there's already a VAST body of Star Trek work out there, the mod community for just about every Star Trek game in recent history has put out a tremendous amount of high-quality work. In fact, if memory serves and my who's who is correct there's a guy out there that did some tremendous mod work for the game Bridge Commander. BC'c graphics looked pretty good out of the box, the replacement models/textures this guy modded in made them look near movie quality. He was then actually employed by whatever company did Star Trek: Legacy. Again, this is to the best of my knowledge and I THINK it's all the same guy. Wow one guy? He must be really good. I have got the game Bridge Commander it was good, and so are your models. What object did you use to start off with for the Constitution Class Starhip and did you use a reference image? Oh yes, definately used reference images. I found some very good ones, very high resolution, after searching around with Google for awhile. I've found with modelling stuff like this it's best to have extremely good high-resolution blueprints and some pictures of the real-life prop or model - there's just some places you can't quite get a feel for even with the best blueprints. I used a vertical cylinder to start off with in front view, messed around with the dimesions until I got it right with the blueprints for the "sides" of the saucer section, then converted it to a mesh. From there I selected the top and bottom faces, inset them several times until I was close to the middle. From there, I would select one of the loops and raise it on the Y axis to get the desired shape of the top and bottom. The textures I made from scratch with Paint Shop Pro 8. Those look great. For the saucers, did you convert them to subdivided once you had the proper shape, or did you leave them as a mesh? Just some constructive criticism...coming from a Star Trek fan... Your loknar class looks pretty good, but the boom section doesn't look like it's in scale with the engineering section... it looks too small in your renders. 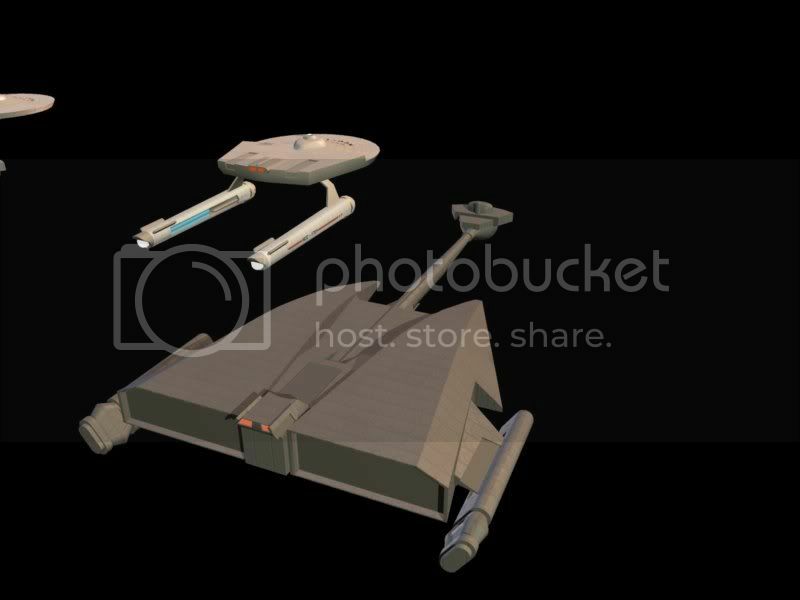 Very nice 'fat man' (I think that's right, I have a book somewhere) class klingon cruiser! May I say that while the textures for your Federation ships are quite nice, especially where the nacelles are concerned, your klingon textures could use some work... If you see any of the original series where they had a klingon ship, it was actually a smooth, light grey, almost plastic look. The next version had a rusty steel look, and seemed to always look like it was missing some hull plates... Hopefully these comments will help you. Very nice work in any case! In the republic of mediocracy; knowlege is power, and power is dangerous. Kahlua17: I left them as meshes. Blank Studios: Regarding the Loknar, I think it's just the camera perspective, but I'll recheck it to the schematic. Regarding the Klingon textures, I totally agree with you. The textures on those ships are just placeholders at the moment - it's just the plain Federation texture set darker. Because those ships are a lot more "irregular" than the Federation ships, I think I'm going to have to do an unwrap on those.